With the advent of wearable healthcare devices and remote monitors, Internet of healthcare things is now a reality. Using the power of big data analytics it is possible to monitor and intervene in health events to ensure maintenance of health in all its aspects. This article discusses the various issues involved. With the advent of ‘electronics age’ in healthcare, humungous amounts of data of varied types from verifiable sources is continuously getting generated in ever-increasing volume. By analysing this ‘big’ data, for that is what it exactly is, the practice of preventive medicine and ensuring continued wellness is now moving from the academic world of debates and discussions to the real world of healthcare services. Before getting into big data in healthcare, it is necessary to try and understand the term ‘big data’. It is important to realise that not all data qualifies as ‘big data’. Big data is data having certain special characteristics. These are high volume, high velocity, high variability, and high veracity – the 4V’s of big data. In healthcare context, a good amount of data of various types from verifiable sources gets generated during a single patient encounter irrespective of the care setting (OPD, IPD, or emergency), even in non-electronic environments, at quite a reasonable rate. With just the use of electronic medical records, this amount increases dramatically as more data gets recorded and retained. When data collected by an individual gets added to this, the volume becomes pretty high. By 2015 it was estimated that average US-based hospitals alone were generating 665 terabytes of patient data per year. This relates to volume. Through the use of health monitors, medical devices and wearables, the rates at which the generated data get collected is also quite significant. This relates to velocity. The types of this data ranges from binary to alphanumeric text including audio and visual, and in structured, semi-structured as well as unstructured formats. This relates to variability. The sources of these data are known and trusted with lot of it being collected by those who have been authenticated prior to data collection like doctors, nurses, paramedics, etc. This relates to veracity. Coupled with the availability of large quantities of electronically-processable data are a number of concomitant technical advances that are driving big data analytics. These advances include multi core processors, low power-consuming devices, low storage costs overall and high-speed local networking. It is the very nature of big data that makes their analysis demand special consideration. The process needs to factor in the high volumes of varied types of data in varied formats arriving very rapidly in real-time. As a consequence, the traditional analytical processes are rendered impracticable, forcing special methods to be adopted. Special systems for data storage, data retrieval, data preparation and data analytical are employed to ensure this. The sources of such data are many. To name a few, care providers supply data via Electronic Medical Records (EMR), Electronic Prescription or Order Entry (CPOE) systems, Medical Administration And Reconciliation Systems (MAR), Hospital Information Systems (HIS), and health monitors (used mostly in critical care settings). Increasingly, however, the patients themselves are proving to be substantial generators of such data through the use of data collecting agents in the form of wearables, home-based monitors and medical devices, and mobile health apps; not to forget their social media posts that include Twitter feeds, Facebook entries etc. The payers contribute through generation of insurance claims data and the government through generation of regulatory compliance data. Generation of data is one thing, but until that data is pooled prior to its processing, it is as good as being unavailable. Salvation in this regard comes from the ‘Internet’, or more precisely, the ‘Cloud’ that provides the necessary networking infrastructure that facilitates data exchange. Internet of healthcare things is expected to play a crucial part in this regard. The Internet of things (IoT) is the inter-networking of ‘things’ represented by physical devices, vehicles (also referred to as ‘connected devices’ and ‘smart devices’), buildings, and other items embedded with electronics, software, sensors, actuators, and network connectivity that enable these objects to collect and exchange data. Typically, IoT is expected to offer advanced connectivity of devices, systems, and services that goes beyond machine-to-machine (M2M) communications and covers a variety of protocols, domains, and applications. As of 2016, the vision of the Internet of things has evolved due to a convergence of multiple technologies, including ubiquitous wireless communication, real-time analytics, machine learning, commodity sensors, and embedded systems. This means that the traditional fields of embedded systems, wireless sensor networks, control systems, automation (including home and building automation), and others all contribute to enabling the Internet of things. When these ‘things’ are healthcare-related, they get christened as ‘healthcare things’. Suman Bhusan Bhattacharyya is a practising family physician and a business solution architect for medical devices and healthcare IT applications with nearly twenty nine years of experience. He has worked for several IT MNCs in India and is currently Head of Health Informatics in TCS based out of Delhi-NCR region. 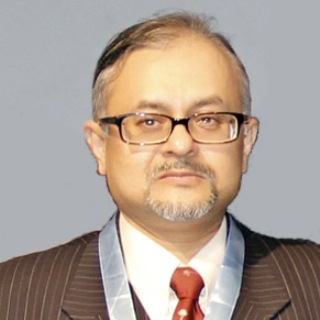 Currently, he is a member of National EHR Standardisation Committee, Ministry of Health and Family Welfare, Government of India, member of Healthcare Informatics Standards Committee, Bureau of Indian Standards and also member of Standing Committee for IT, IMA Headquarters. His main areas of interest include clinical data analytics particularly treatment protocol planning using predictive analytics, designing EHR& EMR systems, mobility applications and application of machine learning techniques in healthcare.